With every step, you get more tender, each step is one too many and you just wish you could sit down and rest. So why do you have this problem and you are asking how to cure heel pain fast and for good? Having heel pain is a right pain in the… foot! This is a very common foot problem where the fascia tendon that runs along the sole of your foot from heel to toe gets torn, inflamed or damaged. Because this tearing usually occurs around the heel area, it causes severe pain when walking, especially first thing – you get morning heel pain when you get out of bed as the fascia stretches and tears again. Those first few steps can be agony! If you have Plantar Fasciitis for long enough, it is possible that you can develop what is known as “spurs”, small growths of bone on the edge of the heel where the tendon attaches. The constant repairing of this area can lead to calcaneus growths which, whilst they are not painful in themselves, can press onto the muscles and skin on your feet when walking, which can be very painful. Wearing a poor choice of footwear can lead to a large variety of foot and ankle problems. If you are a fan of high heels, you may already know how painful they can be to wear after a while. However, even wearing a pair of sneakers that have seen better days, or shoes with little support or cushioning around the arch and heel can cause heel pain or worse. People pay little attention to choosing the right shoes, worrying more about how they look rather than how they can help keep your feet in tip-top condition. So now we know about the main causes of heel pain, what can be done to quickly fix this annoying problem? Rest – Take a load off, rest up and try to stay off of your feet as much as you can to help them recover. Ice – Apply an ice pack or cooling pad to the affected heel which will help reduce any swelling or puffiness. Compression – Use a bandage, compression sock or perhaps apply some PT tape to help the blood flow to the affected area. Elevation – Make sure you keep your foot raised, at a level above your heart if possible as this will help keep your circulation working properly. You are probably doing this already when you sit down to rest, kicking off your shoes and socks and rubbing your heels, which is essentially massage. A foot massage will help to relieve any tension in your muscles which will reduce any stress to the tissues and tendons surrounding the heel. There are some additional things you can do to get more out of doing this though. Try applying some oil to make the massage easier. There is nothing worse than trying to rub pains away from dry, cracked heels. The oils or creams can also be heated up too which will help soothe your aches and pains, or look for massage or essential oils that contain spices or herbs that will give that hot feeling. To massage your heels properly, try applying pressure using your thumbs to the painful area on your heel for a few minutes and then proceed to massage the rest of the foot – and repeat. 3. Buy some insoles, heel cups or inserts. There are a huge number of products available to help cure heel and foot pain. The majority of these can be purchased from your local store too – so no need to go to a podiatrist at all. These shoe inserts are sold in pairs and slip into your shoes to help give you proper support around the arch and heel area. There are many different kinds available, with different features such as memory foam, gel pads or EVA foam. You may need to experiment until you find one that works well for you though and they will work differently in different pairs of shoes. If you opt for using an orthotic, there are 2 things to remember though. Firstly, don’t buy them from a podiatrist or doctor as they will most likely try to get you to buy ones specifically designed for your feet. However, research has shown that they are no more effective than ones you can buy from your local drugstore. Secondly, when you started to use them you may not notice any difference at first – in fact, they may make your feet more painful for a while – but you need to get used to them. Try wearing them for a short period, to begin with (no more than an hour at a time) and build the time you are using them up slowly. These are similar to orthotics but are designed to sit inside your shoe at the heel end, giving you more support and cushioning. They are often padded or have a squashy gel inside which helps reduce any impact and shock as you walk. Again, there are many different brands available with different features. However, I have found gel heel cups to be very effective and make a lot of difference. 4. Get some proper shoes. This is the best advice and having a good pair of shoes will help to reduce many different kinds of foot pains. Ensuring that they have good mid-sole support and a heel area that supports and cushions your foot is very important, as is making sure they fit properly. There are shoes made specifically for people with foot pain problems that have been designed by podiatrists and doctors. The company is Orthaheel and they feature as highly recommended in our article about the best shoes for people with plantar fasciitis. One way that I try to treat my plantar fasciitis and to help cure heel pain quickly is to stretch as much as possible. It is recognised by podiatrists that having tight or short calf muscles and hamstrings can lead to heel pain. Where the muscles are tight, they pull on the ligaments and tendons that stretch down around the heel which can cause tension and lead to damage. Make sure that you stretch as often as you can. The best calf stretch exercise is to stand with your toes on the stairs and lower your heels down, holding the stretch and not bouncing up and down (which can lead to more damage). As you have read, there are many causes of heel pain, plus many treatment options too. 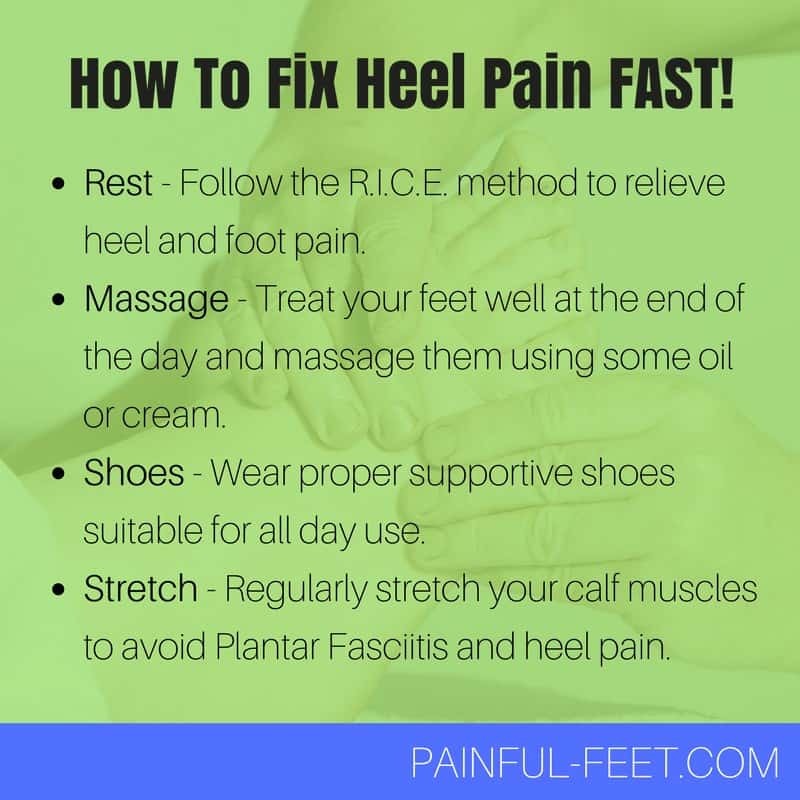 If you are looking to cure your heel pain as fast as possible, I would recommend following the RICE method (or even the PRICE method) and ensure that you wear a proper pair of supportive shoes. Heel pain should not last longer than a few weeks at a time, so if you have followed these points and have still not seen any improvement, seek proper medical attention. Attending to see a podiatrist after trying some “simple fixes” like these will save you time and money as you will not be just sent away to try them and then have to return for another appointment.